Thanks for the tip prochiro. I'll give that a try. Hi folks, this may be a little hard to convert, though it is all i have to experiment with at the moment. @ufo, will this 3 pole motor show the same effects or no, thanks. Last edited by Ufopolitics; 07-13-2012 at 08:14 AM. If I understand this correctly, the difference between this kind of winding and a traditional winding is that this is in essence a unidirectionally steered motor, in that sense that the coils are always excited in the same direction. In other words: there is no forced reversal of polarity. The magnetic force maintained in this loop is a dynamic force, much like a flowing waterfall, which in the static case exerts a force that is balanced across the poles, symmetric, and therefore no resulting force. 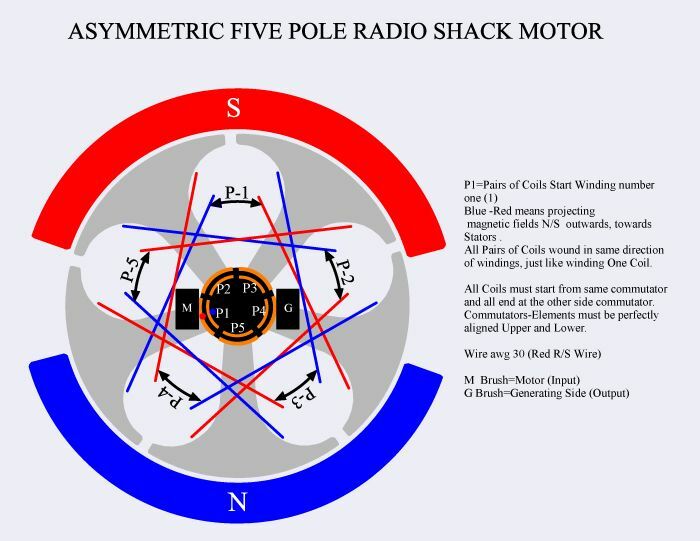 However, with a gentle unidirectional tickling of the coil, you can bend this already existing force, such that you create an imbalance in the system, and you get some asymmetry, which gives you a torque. The problem with the normal way of winding is that because of the disruptive switching characteristics of the commutator, you use a lot of brute force to enforce sudden changes of the magnetic field trough your poles, which is expensive in terms of energy. With the overlapping way of winding AND uni-directional steering, you don't get these brute sudden changes in the magnetic field, but you allow it to change gradually. In other words: with UFO's way of winding YOU only have to provide the energy needed to "bend" or "redirect" the already existing magnetic field, while with the normal way of winding YOU have to spend a lot of energy to kick the magnetic field back and forth between two extreme "redirection" positions for no reason at all. my replication of your motor works and that on a friday 13th. It is incredible that by connecting the plus and minus totally assymetrically the motor spins and very well. OK i have to calm down now and go on the experiment and testing. Just for the other replicators. I begin the winding by fixing the wire (for me 0.2 mm copper wire ) at the small hooking point on the collector. Than i begin to wind the first 25 turns as per Ufo shematic, than with the same wire (no cutting) i began the next 25 turns in V shape, than i fix the end on the opposite hooking point on the collector. So the same wire winds the 2 X 25 turns. And that 5 times. My 2X 25 turns (or 50 turns ) gives about 1.6 ohm dc resistance. Great work woopi, and good video too. Do you have any readings of volts/amps? Well done Woppy. I have had mine quickly running both ways, goes very fast. Had a slight snag, I used some shellac to seal up the windings, which I thought had dried - It hadn't and spun it out through the motor like a centrifuge! Be dry tomorrow.